Get a FREE printed copy of our Play Like Yours Blue Heroes, worth £9.99, and learn to play like the finest blues guitarists of the past 100 years. All drawn from articles in Guitar Techniques, this 100-page special is packed with fully tabbed lessons on how to play like the most influential bluesman ever. All you need to do is call 0843 381 0196 and quote code BLUES01, you'll get free delivery as well. Including Delta legends Robert Johnson and Big Bill Broonzy; BB King, Freddie King, and Albert King; blues-rock virtuosos Joe Bonamassa and Gary Moore; Stevie Ray Vaughan; slide maestros Sonny Landreth and Derek Trucks; and many more. 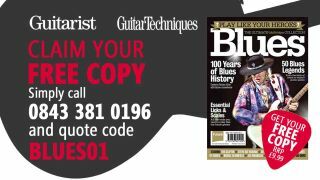 Simply call 0843 381 0196 and quote code BLUES01 to get your FREE copy.